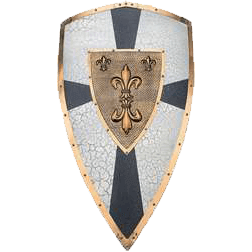 This ornate, full sized shield by Armaduras bears the Fleur-de-Lys crest of Charlemagne, ruler of the Holy Roman Empire, mounted over the blue cross of Lorraine. 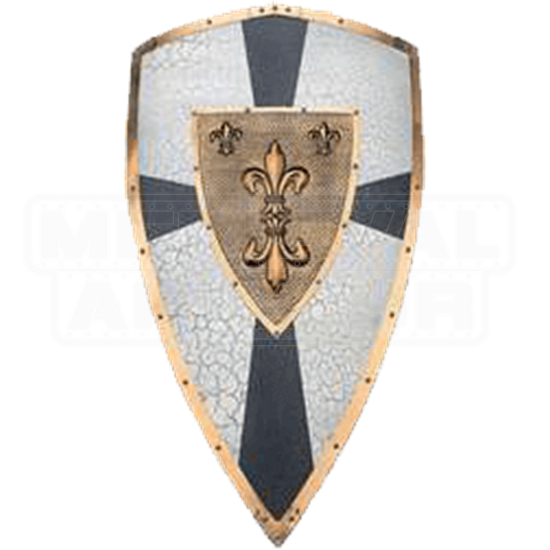 Crafted in Toledo, Spain, the shield is made in burnished steel with bronzed embossing and antique-finish paint decoration. The piece is equipped for wall hanging and is complete with a back-mounted bracket that allows one or two swords to be fixed behind the shield for an outstanding wall display.